Thank you Gapplegate Classical-Modern Music Review for recommending Donut Robot! Read the rest of the review on the Gapplegate Classical-Modern Music Review site. A/B Duo's "commitment to widening the repertoire and to fresh, vibrant new music"
This article originally appeared in Issue 40:4 (Mar/Apr 2017) of Fanfare Magazine. MCGOWAN Ricochet. DICKE Isla. REINKEMEYER Wrought Iron. BAKER Limb. BROWNING Sol Moon Rocker. FREDERICKSON Breathing Bridge. RANDALL-MYERS Glitch. A previous disc by Meerenai Shim on the Aerocade label (001, Fanfare 40:2) was mesmeric and fascinating. Here, Shim is joined by percussionist Christopher G. Jones: Together they fashion a sequence of soundscapes the like of which you may not have encountered before. First, a warning. Make sure, if you are listening on headphones, that the volume is set nice and low for the first track. I didn’t, to my cost. The disc announces itself assertively with a conversation between staccato contrabass flute (used in the manner of a percussion instrument) and percussion. This opens Ned McGowan’s Ricochet for contrabass flute, floor tom, three suspended cymbals, three woodblock, triangle, and flexatone. It is worth reproducing the scorings for each piece, as they give some idea of the sounds each one works with. The idea of ricochet evokes both the idea of game and of conversation, although if it is the latter this is a pretty full-on, wide-eyed discussion. Rhythms are fantastically (sometimes frantically) taut. The A/B Duo commissioned this work, a measure of their commitment to widening the repertoire and to fresh, vibrant new music. A remix of Isla Ferrari’s Isla de Niños, Ian Dicke’s Isla for flute, vibraphone, and live audio processing takes a line that is itself relaxed and garlands it with a plethora of active, energy-laden lines. The tension between the two elements forms both the starting point and the basis of the piece. Effective use of audio processing in the sampling and juxtaposition of syllables at one point forms the backdrop to a vibraphone solo. Andrea L. Reinkemeyer’s Wrought Iron for flute, vibraphone, bongos, tambourine, triangle, china cymbal, and splash cymbal is a musical response to a building, the Troy Savings Bank Music Hall. In a rather neat conceit, the various shapes used in the hall itself determine the types of instruments used: triangles are the obvious instance, but circles also (cymbals, bongos, tambourine) and rectangles (vibraphone). The architect also tried to make metal look like stone, and in the spirit of referencing others, the composer invokes the ghosts of Beethoven and Chopin, both of whom are to be found within the confines of the hall itself. There is an intricacy to the players’ interactions that seems, to the present writer at least, to invoke or reflect some sort of physical design. Ensemble between the two players needs to be particularly tight in this piece, and the result is indeed magical. Drew Baker’s Limb for flute/piccolo, vibraphone, Thai gong, wind gong, and three crotales, finds cymbal evoking the crashing waves of the ocean. It opens quietly, hesitantly. The work is a response to the “scribble line drawings” of Sol LeWitt. Both LeWitt and Baker are involved with what Baker refers to as sensuality of gesture, and through simple but effective means Baker draws up an imposing, and imaginative, soundscape. As the booklet notes, state, “this piece is exceptionally soft and loud.” And although the track has been compressed “to save your eardrums,” it is still worth pointing out that you have been warned. If you wish to serve your masochistic side, there is an uncompressed version available by request and the email address is given in the documentation. Simple but effective, the piece paints gestures over relatively large durations. Scored just for flute and vibraphone, Sol Moon Rocker by Zack Browning is another A/B Duo commission. It has a philosophic basis, the dynamic between yin and yang, between Moon and Sun. Intriguingly, the second part of the work is generated by applying Feng Shui principles to the birth dates of both present performers. It gets deeper still: the section “Meerenai’s Moon Flight” is generated also by the Magic Square of the Moon; “Sol of Chris” has a similar basis, using the Sun Magic Square. References to relevant popular music are there, too: It’s a Man’s World (James Brown), Ladies’ Night(Kool and the Gang), and The Sun and the Moon have Come Together by The Fourth Way. It’s quite the tapestry, and it works brilliantly. There is actually a spirit of joy that suffuses the musical surface of Browning’s piece; quotations have a sort of exuberance about them. The final section offers a synthesis between male and female. The idea is wonderful: One wonders if some elements of alchemical theory could have been worked in there also? Scored for flute with glissando headjoint, glockenspiel, and vibraphone, Brooks Frederickson’s Breathing Bridge carries an entreaty: “If you’re ever in Brooklyn, listen to or imagine this piece while walking on pedestrian bridges around Red Hook.” On this bridge, one feels viscerally the vibrations of passing vehicles; lines in Frederickson’s piece represent the bridge’s structure. There is much delicacy here; the performance is simply beautiful. If one were to make that walk (no opportunity to research that; I’m afraid as I’ve never been to even America, never mind anywhere as specific as Brooklyn), one can only imagine an altered experience, a different and enriching way of experiencing the environment. Finally, there comes Brendon Randall-Myers’s Glitch for flute, vibraphone, and drum set. In contrast to the lulling aura of the preceding track, Glitch is colorful. Written for the A/B Duo’s “quirkiness, virtuosity, humor and groove,” it imagines a “prog-punk video game music cover that can’t decide what tunes to play or what tempo to play at” resulting in some “bizarrely hilarious musical collisions.” That promise is certainly lived up to in this rather garish ride. It does rather sound as if the players are having fun, too. The notes make a point of announcing that Christopher G. Jones plays the vibraphone with his left side and the drum set with his right side. Patting one’s head and rubbing one’s tummy at the same time? There is a slower, more shaded section that provides contrast, as if offering cool shade before re-entering the bright sunshine. "first-rate performances" in A/B Duo's Variety Show! With this duo release, the Aerocade label continues along its path of presenting excellent recent compositions in excellent sound. I’ll admit to unfamiliarity with the composers whose works are on offer here, but their quality and intrigue is matched by first-rate performances and a very warm but detailed recording. One of the most satisfying pieces on this well-filled disc is Ian Dicke’s Isla, composed in 2012. Dicke follows in the footsteps of such composers as Scott Johnson and Pierre Boulez in that he integrates acoustic and electronic soundworlds quite convincingly into this widely varied piece for flute, vibraphone, and live audio processing. Like Johnson, speech is an integral component, but in this case, it is chopped up into micro-fragments that mirror and drive the instrumental rhythms and timbres forward. The A/B Duo creates an integrated yet somehow also heterogeneous sound, and this is also the case on the rhythmically dizzying Glitch, by Brendan Randall-Myers, composed in 2015 and commissioned by the Duo. There, the electronic world has a direct influence on how acoustic instruments are played, bringing those early Stockhausen visions to some kind of fruition. The electronic soundscapes on which this constantly changing piece is based recall the improvised music of trios such as Phronesis, Meerenai Shim, and Christopher Jones, and the intimate familiarity here with those sounds is like a Classical-era ensemble handling the rhetoric of contemporaneous dance forms, to site only one example. If all of this sounds too far afield of the classical music mainstream, take heart, as there’s even some of what Frank Zappa called “a bit of nostalgia for the old folks.” Andrea Reinkemeyer composed Wrought Iron (2012, on a commission from the Albany Symphony and for the Troy Savings Bank Music Hall, an acoustically marvelous space I’ve loved for many years). The piece takes on tropes like Debussy and Ravel, and possibly a little Stravinsky thrown in for good measure; it’s hauntingly melodic and fun, dancing and almost running its way forward. There may even be a little Zappa in the syncopation and in the whimsical handling of modes. A/B Duo's Variety Show was featured on Bandcamp's Best of Bandcamp Contemporary Classical: November 2016! Read the rest at daily.bandcamp.com. 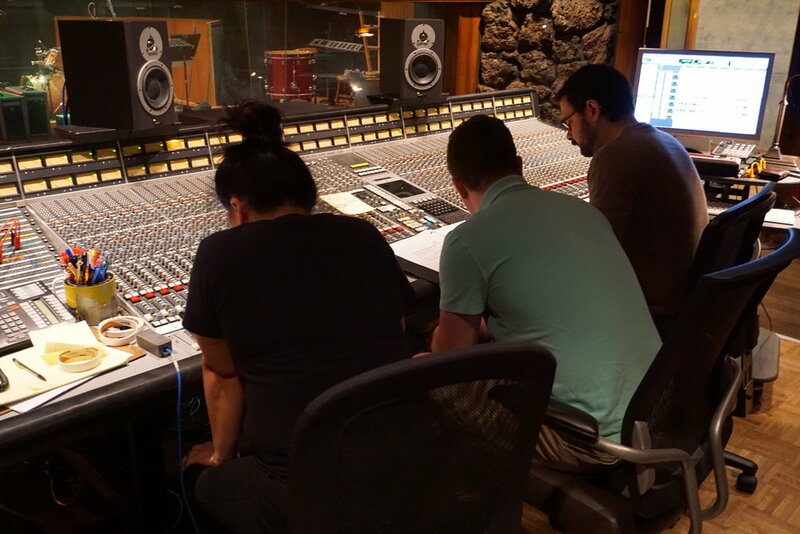 Pre-order the new A/B Duo Album, "Variety Show"
A/B Duo listening to mixes with engineer Alberto Hernandez at Fantasy Studios. 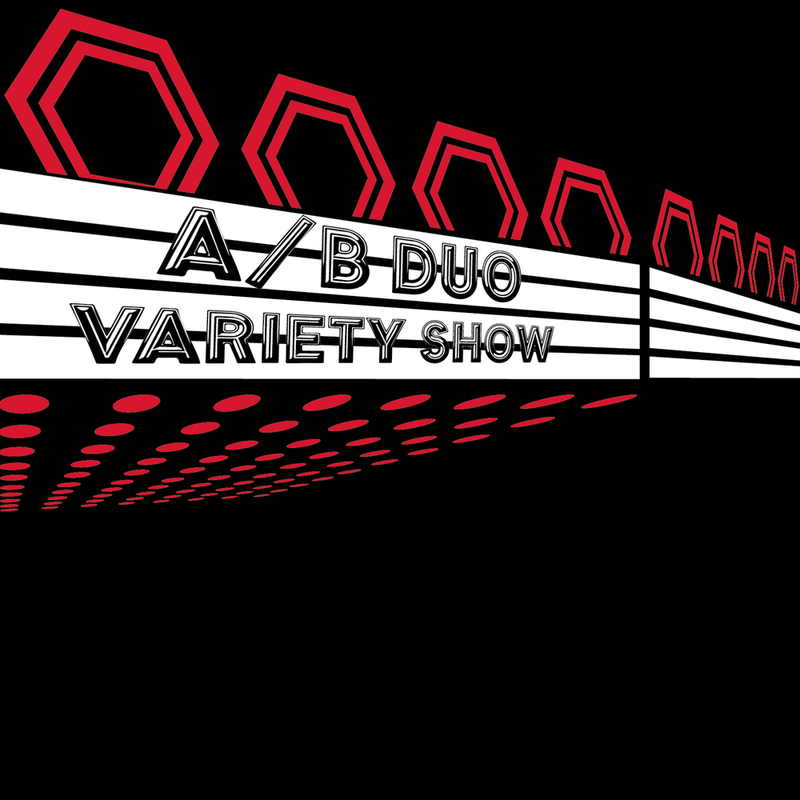 You can pre-order our next release, A/B Duo's "Variety Show," via Kickstarter right now. It will feature 7 compositions for flute and percussion by Drew Baker, Brooks Frederickson, Brendon Randall-Myers, Ian Dicke, Zack Browning, Andrea Reinkemeyer, and Ned McGowan. Sign up with your email address to receive the latest news on releases. We respect your privacy. We will never share or sell your email address to anyone!